There are a number of terrific clubs and organizations for our students to choose from, including Student Council, Annual Staff, Paper Staff, Fellowship of Christian Athletes, Math Club, Science Club, FBLA, and DECA. 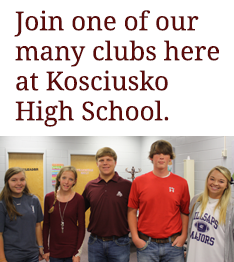 As always at Kosciusko, academics take precedence, and students must be in good academic and disciplinary standing in order to belong to clubs and organizations and to attend meetings. If you’re interested in joining one of our clubs, check with a supervising teacher to learn more. Our student council works with school advisors to plan events and make decisions that will affect the student body of Kosciusko High School. To run for an office, a student must have an overall “C” average in his or her academic subjects at the end of the preceding semester. The annual staff works throughout the year to create a memorable yearbook for our students, complete with student photos, essays, anecdotes, and more. Students on the annual staff should have an interest in writing, photography, or publishing. This hardworking group of students is the force behind Kos-Z-Hi-Daze, Kosciusko’s student newspaper. Running a newspaper takes a lot of work, but being on the paper staff provides excellent experience for students interested in a future career in the publishing industry. Students in the math and science clubs have an opportunity to work alongside (and sometimes engage in friendly competition with) students who have similar passions and academic interests. Both social and academic in nature, these clubs are for anyone interested in participating in math- or science-related activities outside of school hours. The mission of the FBLA is “to bring business and education together in a positive working relationship through innovative leadership and career development programs.” The FBLA sponsors competitive events and awards programs for its members and encourages students to learn more about enterprise and to consider future careers in business. Students interested in marketing, finance, hospitality, business management, or entrepreneurship might want to consider joining DECA. This club prepares students to be leaders and entrepreneurs by encouraging academic preparedness, community service, and professional responsibility. FCA is a Christian sports organization—the largest in America—that encourages youth athletes to use sports as a means of impacting the world for good. Students in this organization focus on implementing values of integrity, service, teamwork, and excellence in their relationships and lives.